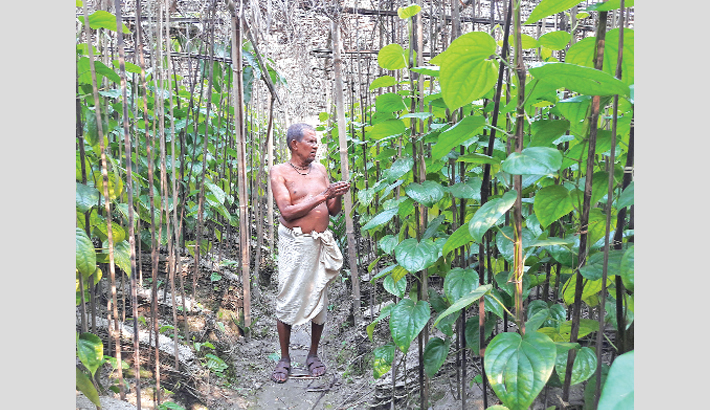 NOAKHALI: Farmers of Noakhali are showing more interest in betel leaf cultivation since they got its lucrative market price in the last couple of years. Betel leaf cultivation is increasing day by day in the district as the farming provides livelihood for many villagers. During a recent visit at Noruttompur Mirzanagar village in Kabirhat upazila of Noakhali district this correspondent found many farmers selling betel leaves at different local bazaars. Kabirhat Upazila Nirbahi Officer Shariful Islam said, 1500 acres of land have been brought under betel leaf cultivation in the district this year. The betel leaves, which were produced here is supplied in different districts. Many people think that betel leaf cultivation is the blessing for them which is left by their ancestors. That’s why farmers of the upazila are interested in betel leaf cultivation, said a trader. Makhon Lal, 60, a betel leaf grower of Sundalpur village, told this correspondent that farmers of this village have been growing betel leaf for a long time. Growing of the leaves has been raised in the district in the last few years for marketing facilities. He also said that about 210 families in the upazila engaged in the profession. Betel leaf farmer Kabir Hossain, 45, said 15-20 seedlings can be planted from each plant. The field of betel leaf is prepared from bamboo, jute and thread. When the plant is 4-5 inches long, then a 5-6 feet long jute stick is placed on the side. The leaves grow slowly and matured for sale after 5-6 months. Then it can be taken to the market in every 8-10 days. Haradon, 55, a betel leaf trader in Chaprashirhat, said betel leaf worth about Tk 30 crore are supplied to other parts of the country every year. “I have been cultivating betel leaf for more than 20 years. At present, I earn Tk 5000-6000 by selling betel leaf in every market”, he said. Department of Agriculture Extension official, said farmers are regularly advised to increase the production of betel leaf in the field, to eliminate diseases and the appropriate use of fertilisers and pesticides. Now the yield of betel leaf is increasing every year. On behalf of the Department of Agriculture, all kind of consultation is being provided to farmers.